Inspired by a friend, I thought I’d look at cocktails in movies. Specifically, cocktails I like in movies. This first one is the Old Fashioned. So named because it’s the oldest cocktail out there. Here is Ryan Gosling making one in Crazy, Stupid, Love. My local speeds up the process of dissolving the sugar in the bourbon by using a milk frother. Without the frother, it takes forever for all the sugar granules to disappear. If not dissolved properly you’ll end up with a grainy sludge at the bottom of your glass; no thanks. I usually use simple syrup instead: 1 cup sugar, 1 cup water; heat until sugar is dissolved, about 3 minutes; store in fridge forever; as that takes care of the sugar and water components of the cocktail. Ryan doesn’t add a cherry to his Old Fashioned, though that is a pretty standard garnish. Some bars decide they want to crush the fresh cherry, then put sugar on it, then light it up as if it were crème brûlée, then add the rest of the cocktail. It’s gimmicky, and it takes forever for the drink to be made. I can see the appeal if you’re sitting at the bar and you have the barkeep’s undivided attention: drink and a show, and a little bit of banter. Photos below of my “signature Old Fashioned” being made taken by a girl enjoying the show. Ryan also skips the dash (or more) of water as watering down the alcohol probably wouldn’t help his end goal. Turns out it isn’t Emma’s favourite drink but she drinks both anyway. He finishes the cocktail by squeezing orange peel over the top of the glass for that distinctive orange smell. One of the bartender’s at my local puts a flame to the citric acid as he squeezes it over the glass. The worst Old Fashioned I’ve had was in Seoul in a usually reputable bar: great Moscow mules; though how hard is that; and the HBC intelligentsia/celebrity bloggers love this place. Holding to the adage ‘to a man with a hammer everything looks like a nail’, they drown their cocktails in orange oil. You know you’ve messed your cocktail up when one ingredient overpowers the others. 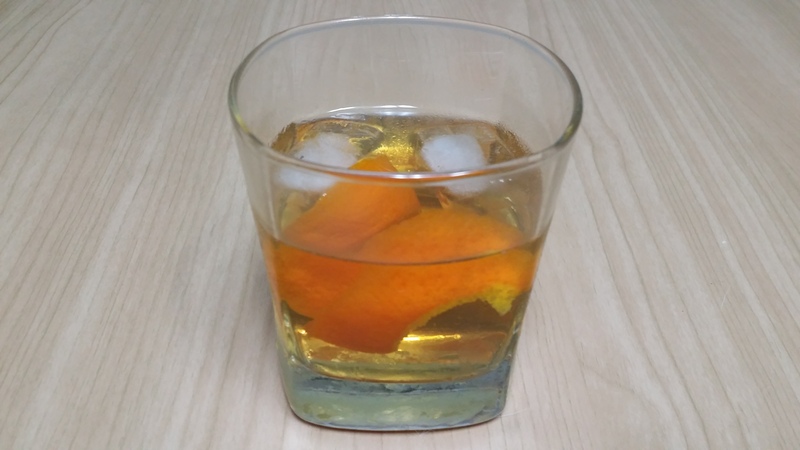 In an Old Fashioned glass (sometimes called whisky glasses, these have thick bottoms) add your simple syrup and a few dashes of bitters. Give it a stir, then add your bourbon. Taste and add more syrup or water as required. Add ice. Squeeze some of the orange peel over the glass before serving.